About 20 percent of the U.S. population experiences problems with hay fever each year, particularly during spring. It results from an adverse reaction to allergens which are present in the air, especially pollen. Other allergens which can cause hay fever include dust, dander from animals and mold spores. Children are especially susceptible to hay fever, and parents can speak with their pediatrician to determine which treatments are necessary. Below are some tips that will help you effectively manage this condition. Hay fever, which is also referred to as allergic rhinitis, is a condition where the immune system responds aggressively to allergens. Children may sneeze profusely, or their nose may be runny or stuffy. Their eyes may also become watery, reddish or itchy. In severe cases swelling is common near the eyes. The fluid which leaks from the nose will be clear in color. A child that develops hay fever will begin displaying symptoms within a few minutes, and it may interfere with their work or concentration in school. Children who suffer from asthma are highly susceptible to getting hay fever, as well as those who have a genetic disposition to it. An environment which is full of dust, pollen or pet hair significantly contributes to this condition. Pollen is a type of miniature cell which is derived from flowering plants. While the pollen emitted by garden flowers usually doesn’t cause allergies, the smaller pollen produced by grass or trees can be inhaled as it travels through the air. 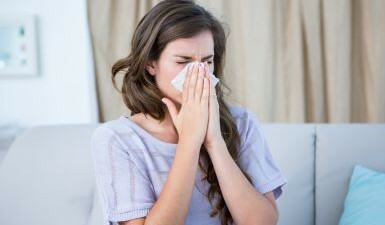 Many of the symptoms which are associated with hay fever are similar to those of the common cold. If home treatment seems ineffective, and the hay fever worsens or reoccurs frequently, the child should be taken to Dr. Samadi for further evaluation. He can assist parents in determining which treatments are most effective. Severe cases of hay fever will often require either non-prescription or prescription antihistamines, which will manage the symptoms. Special allergy tests can be used to determine a child’s sensitivity to various allergens. The most common tests used for this process are skin and patch tests. However, these tests should only be conducted by a doctor, as it can harm the child if it’s done incorrectly. In some cases, a RAST blood test can also be used to determine a child’s susceptibility to allergies or hay fever. Parents with questions about this condition should contact us at ENT for Children.